Sangamon County Courthouse is located at 200 South 9th Street, Springfield IL 62701; phone: 217-753-6600. Photo: Edwards Place, ca. 1833, 700 North 4th Street, Springfield. 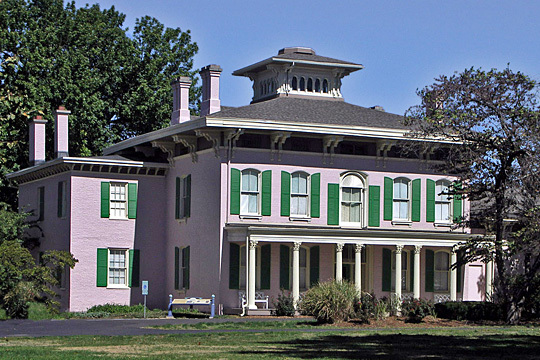 Currently the home of the Springfield Art Association; listed on the National Register of Historic Places in 1975; photographed by username:Notmatisse, 2004 (own work) [CC-BY-3.0 (http://creativecommons.org/licenses/by/3.0)], via Wikimedia Commons. Formed in 1821, the county is named after the Sangamon River flowing through it; name is derived from a Pottawatomie Indian word meaning "where there is plenty to eat," or "good hunting ground." Actually, the county was initially named "Sangamo" with the "n" added some time later, for reasons unknown. Springfield, the State Capital of Illinois, is also the seat of government for Sangamon County.